Carolingian,The West Frankish Kingdom. Eudes, AD 888 to 897. Eudes is also known as ODO, King of the West Franks. Date : The coinage of Eudes is one of mild contention as to when it was struck. 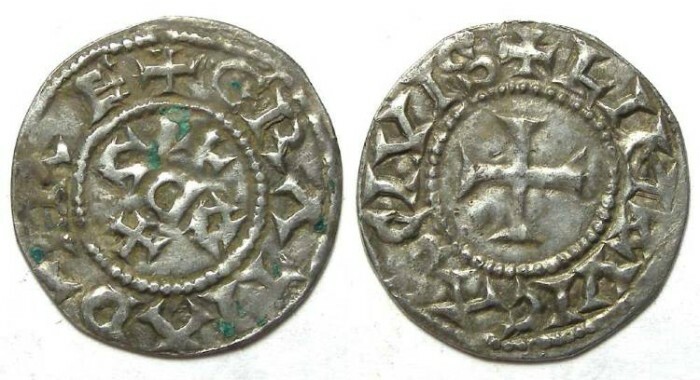 Hoard evidence clearly shows that the type begin during Eudes reign, but it is likey some of the types continued to be struck for some time after his death, well into the 10th century. Size : 21.7 x 22.5 mm. Weight : 1.45 grams. Reference : MEC-973. Prov 783. D-511. Grade : VF and reasonable nice for the type. Obverse : Monogram made up of ODO with crosses above and below, with GRATIA DI REX around. Reverse : Short cross with LIMOVICS CIVIS around.